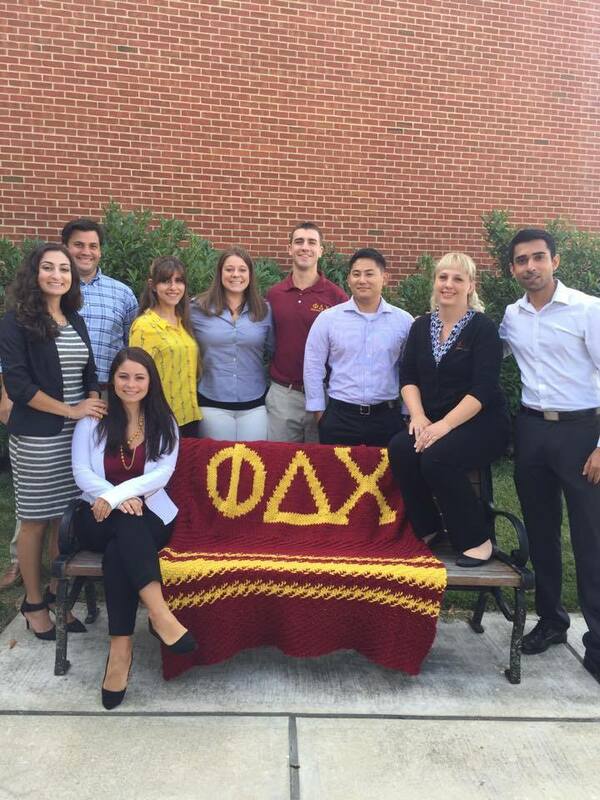 Brother and Worthy Keeper of Finance Carolyn Cooper (’17) has hand-knitted a blanket in our beloved Old Gold and Dregs of Wine, complete with the Phi Dex Greek letters, to be raffled off at Grand Council! Brothers gathered today with Carolyn and the blanket for a sweet photo op! Pictured (from left): Shoghag Aktavoukian, Greg Hayes, Nellie Krastel (seated), Sara El-Baff, Ashley Payne, Geoff Saunders, Andy Lee, Carolyn Cooper, and Visesh Velagapudi.